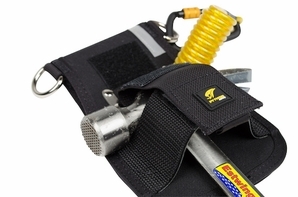 For optimal performance, the Hammer Holster should be used with the 3M� DBI-SALA� Hook2Quick Ring with Tail. 1" D-rings are located on both sides of the holster allowing for the user to tether their tool however they prefer. A Hook and loop closure strap protects hammers from accidental drops during transport, but keeps the tool available when in use.